I don't want the holidays to end. In Finland the 6th Jan is a bank holiday which is the least a Christian would expect. Epiphany, you see. See?! That's just reasonable. But here we are cruelly sent back off to work for a full five day week immediately. No mercy. No more living on the sofa in PJ's with a glass of mulled wine in hand with the only activity of the day to nip to the closest off-licence (jeans worn over PJ's) for more peanuts and wine and then immediately back to sofa and the mulled wine. Husband is in a fleece tiger onesie so can't be sent anywhere. No more staying up as long as we like, which in my case is not much past 10 pm anyway. Oh and I watched the new version of Cinderella again with Lady Rose as Cinderella and the kitchen maid Daisy as one one of the evil sisters. The first time we saw it I had to leave half way to get ready for a girly dinner, and when I popped back in the living room to say bye to husband he was crying into his T-shirt. I asked him if he was actually crying because of the film and he told me that yes, because the step-mum was being so nasty and the little mice were so nice and trying to help Cinderella. I think I am cottoning on to why husband's career as soldier and ruthless killing machine was short lived. And also why he mainly prefers football over drama. Husband threatened to take the Christmas lights down, which I managed to postpone till after Epiphany explaining the whole meaning of the day (thanks Wikipedia) and how wrong it would be to take the lights down and how baby Jesus would cry. And possibly also husband. I have to say husband was great this year, he really took over the decorations. Several days in a row he came home with all sorts of Christmas lights. 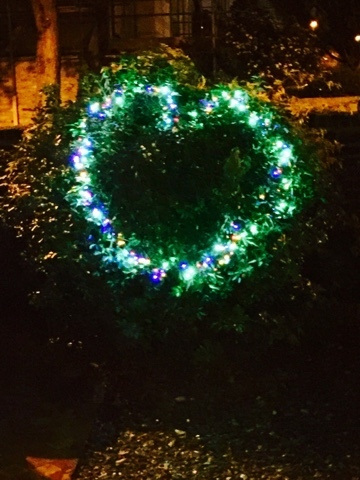 In the end all the shrubs have lights, There is even a heart shaped one in one of the bushes commemorating our first year of wedded bliss (my interpretation), lots of lights in the windows and the door as well. His big regret is he didn't by the Bear. Apparently there was a big polar bear with lights in B&Q discounted from £56 to £12. I'm kind of glad he didn't get it, I'm thinking maybe a bit tacky and also some drunken yoof would have stolen it anyway on his way home from the bar and we would have been upset. 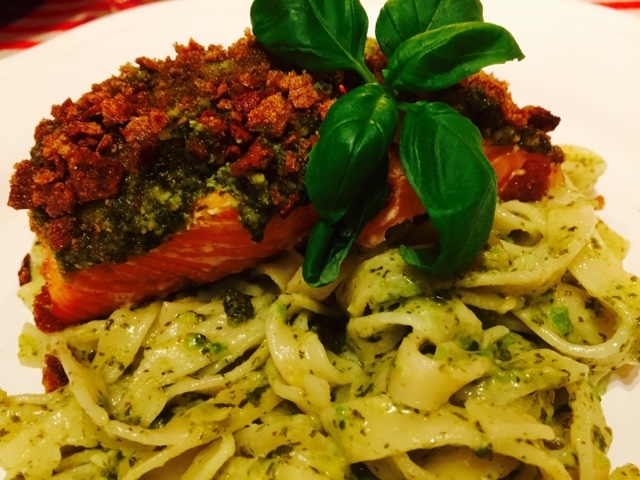 For no other particular reason than that I had the ingredients and quite felt like some pasta, I decided to do an avocado and spinach alfredo pasta sauce and served it with tasty baked salmon. 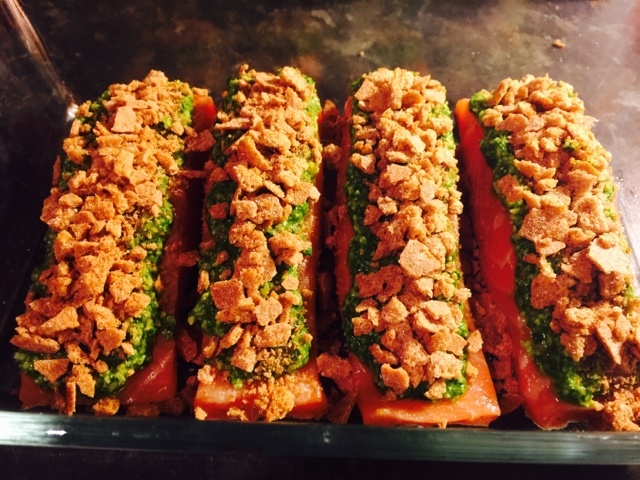 I've developed an attachment to these lightly smoked salmon fillets, they are super tasty cooked in any possible way. 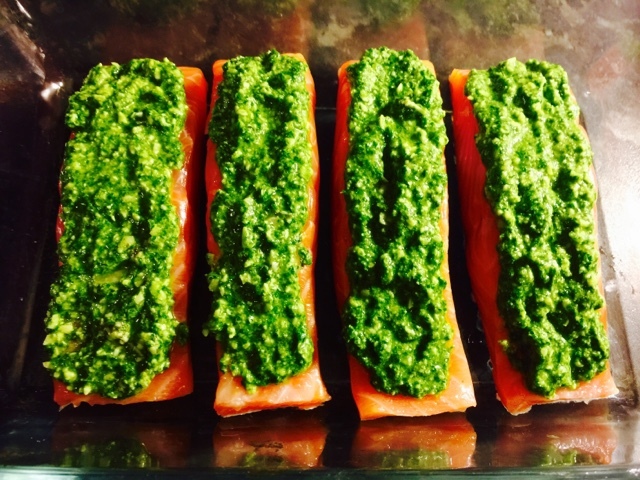 You don't have to necessarily do anything much with the fillets, just a squirt of lemon juice will suffice. 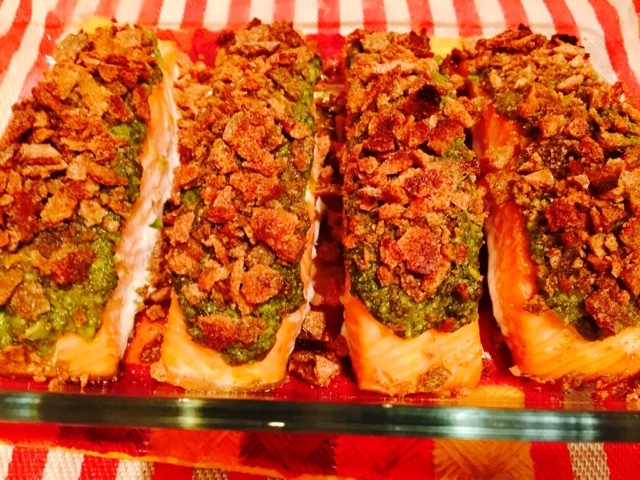 But this time I did my Finn Crisp and pesto salmon. 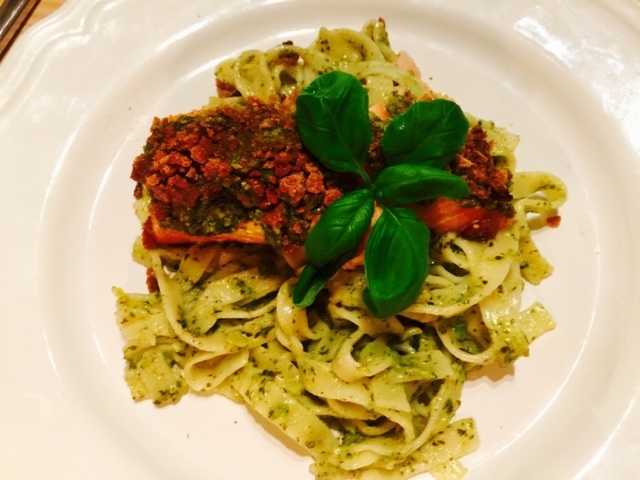 But because the pasta with the sauce is so tasty a simple salmon would go very well. I just felt like faffing about in the kitchen. So I also handmade the pesto, slightly differently from the original recipe this time. But it was equally yammy. Melt the butter in a pan, add minced garlic and cook on low heat for a couple of minutes. Add the spinach leaves and cook until completely wilted. Put the spinach and garlic mix in a blender and mix until smooth. Pour back in a pan and add the rest of the ingredients. Cook until smooth breaking the avocado into bits if necessary. The sauce should be quite thick, if it feels too thin let it cook for a while uncovered. Cook the pasta according to the instructions. Drain and mix with the sauce. Place all ingredients in a blender and mix until smooth. Check taste and add seasoning if necessary.